“Denying yourself and following Jesus” | The Old Adam Lives! Here’s Pastor Mark’s sermon for the 11th Sunday after Pentecost. 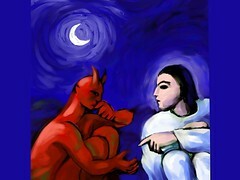 In the gospel text for today, Jesus calls Peter “the Devil”. And thanks to flickr and Will Humes, for the photo.